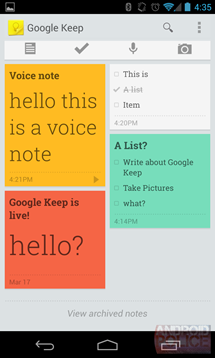 The Google Keep Android app is out, and it is way more functional than the sparse web site. 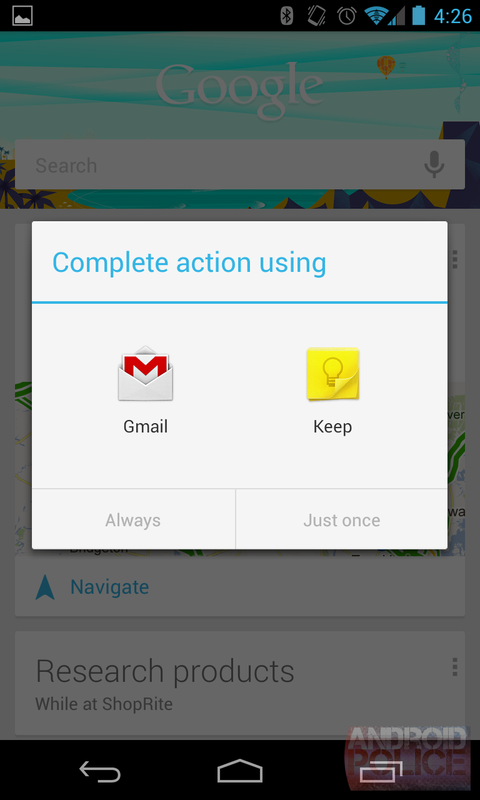 Allow me to show you around. There are two different views to Keep, a multi-column view and a single-column view. Multi-column is "pretty typography mode" and single column is all business. 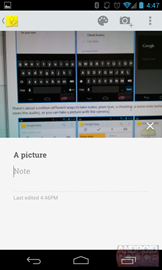 You can switch views with the menu button. There's about a million different ways to take notes: plain text, a checklist, a voice note (which transcribes and saves the audio), or you can take a picture with the camera. 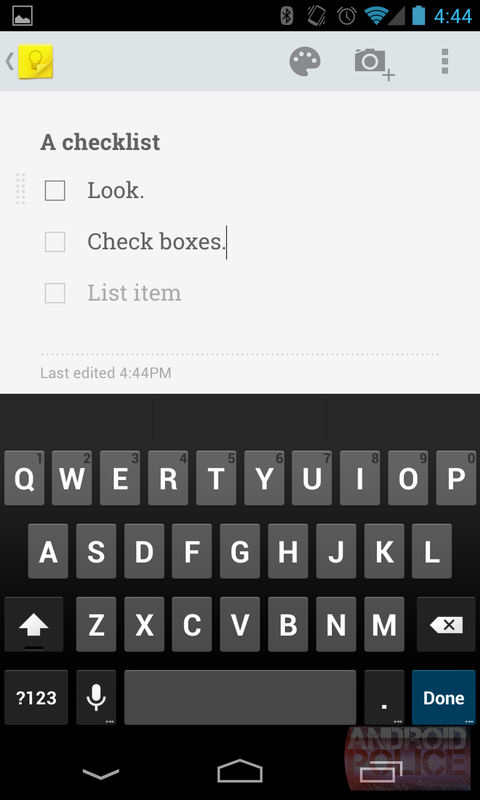 Check list items have little draggable handles on them. 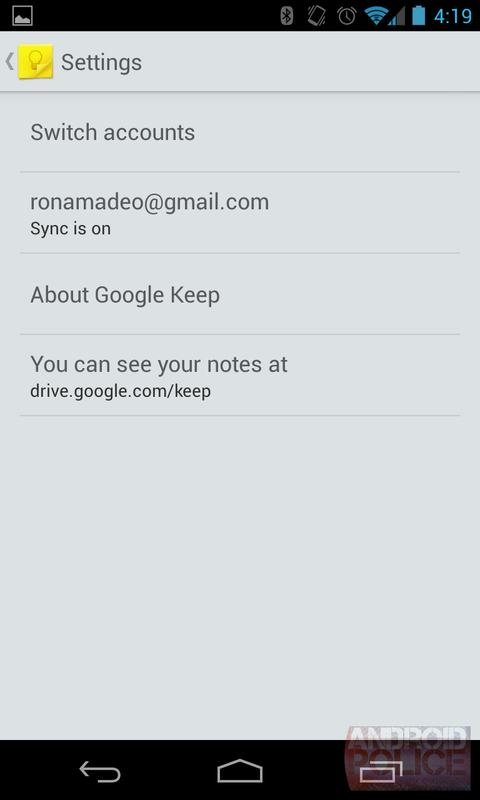 Just like Gmail, archiving a note is as easy swiping it away, and, just like Gmail, there's a handy "undo" popup. 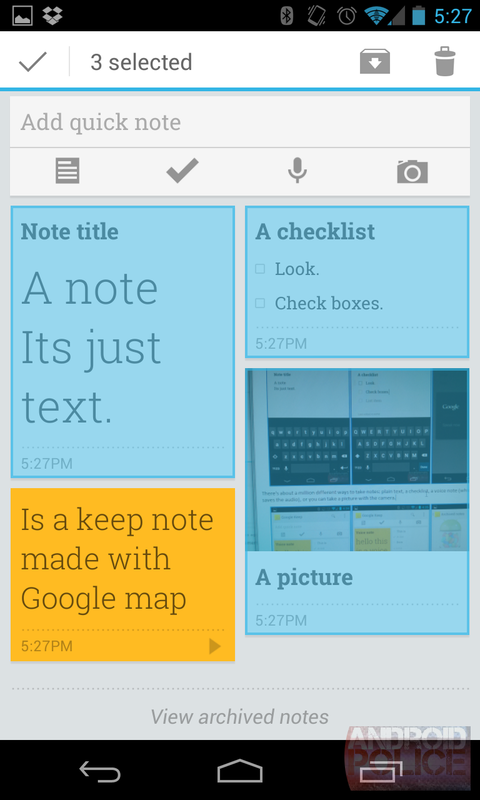 When you archive something, the other notes smoothly slide over to fill in the empty space. 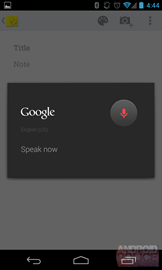 It's really slick. This app is beautiful. 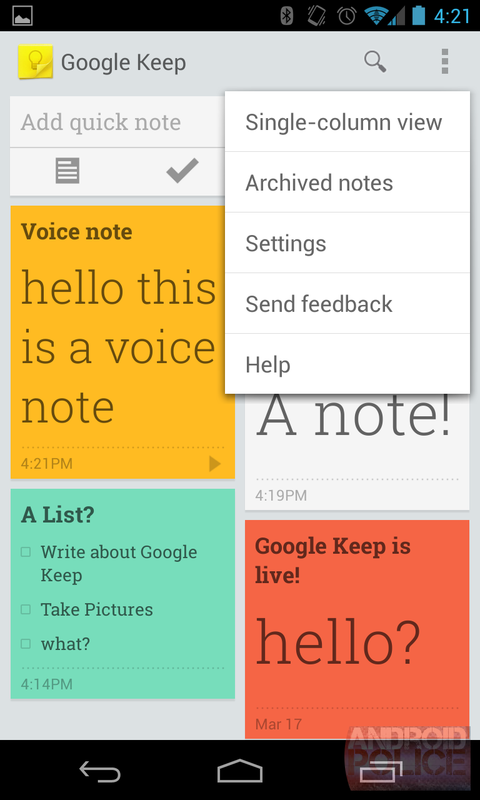 To get to your archived notes, just scroll to the bottom of your notes (or use the menu button). 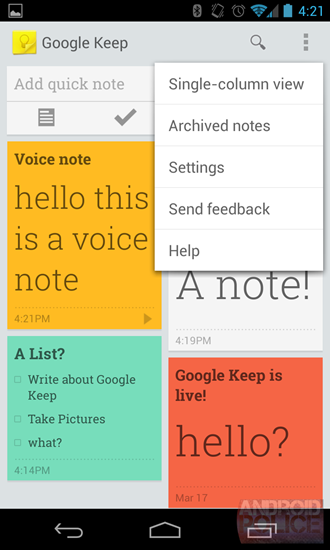 Archived notes are presented in a cool washed-out view. 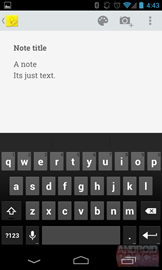 You can select multiple notes by long-pressing. 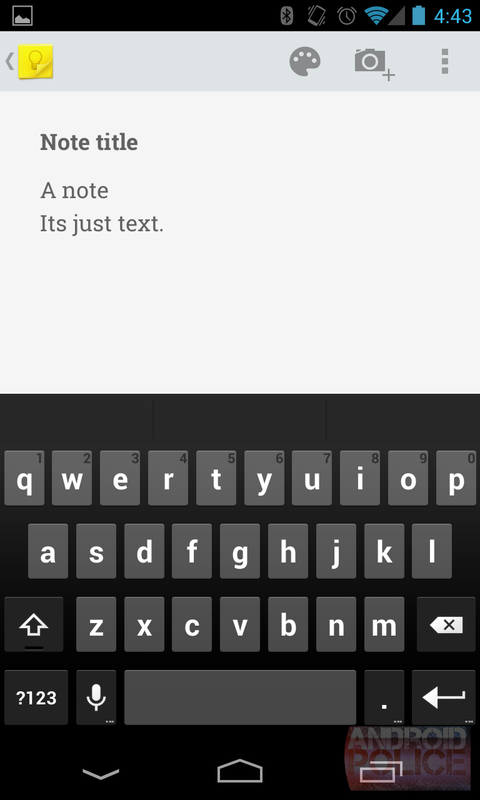 You can also drag a note around to rearrange the order. 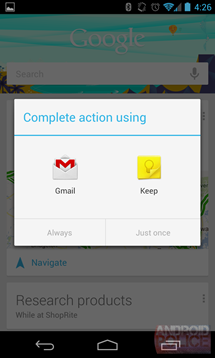 Sadly, it's a weird "drop and hope" form of rearranging, I was expecting the tiles to instantly rearrange, like icons on the home screen. 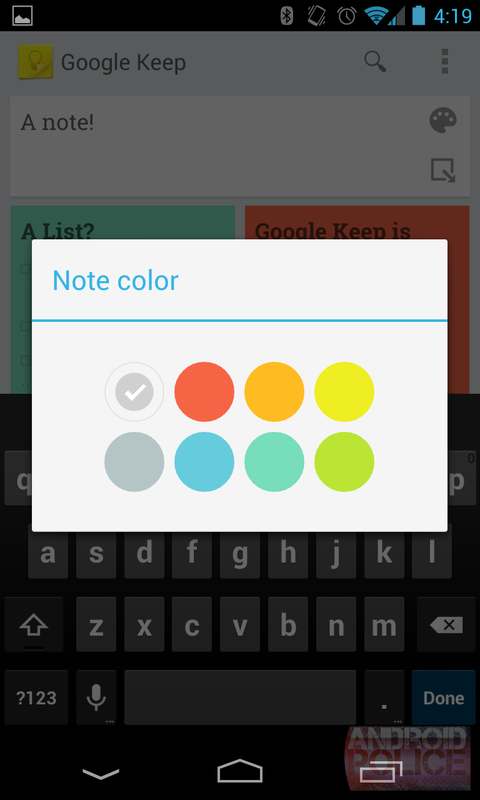 While creating a note, tapping the palette icon will bring up the color options. 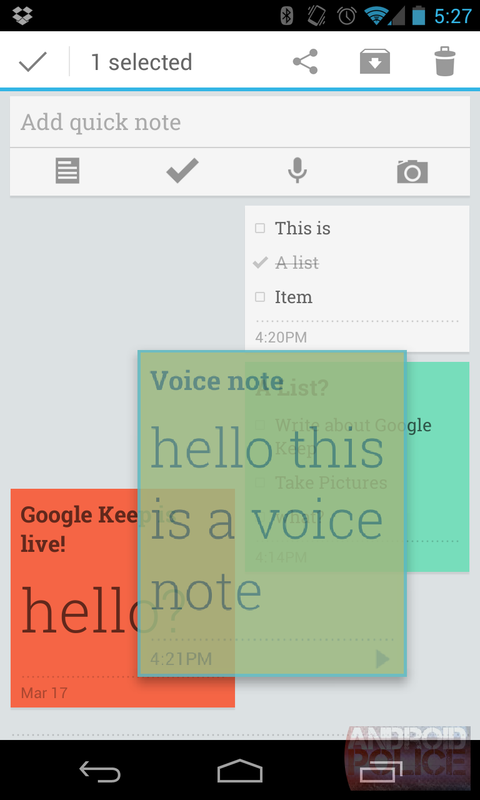 Note colors now take up the entire background of a note, as opposed to the tiny strip at the top on the website. 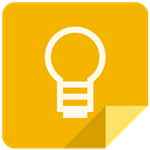 The menu button lets you change column views, and is used for navigating to archived notes, settings, feedback, and help. 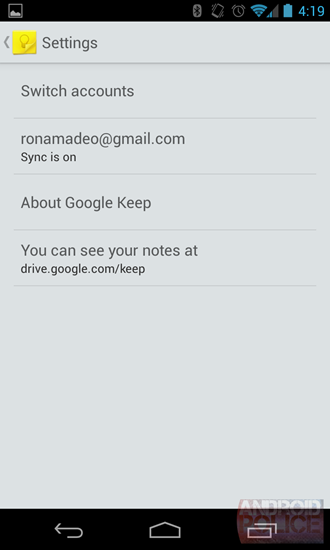 Speaking of which, here's the settings. There's nothing special here. 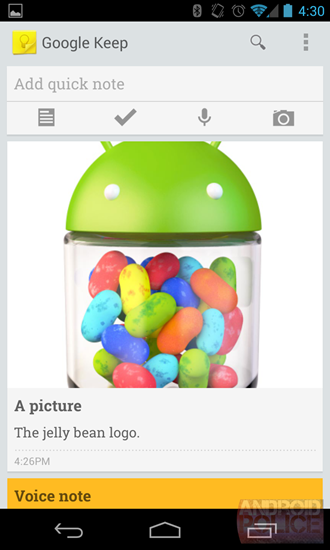 It turns out we're already on version 1.0.77. Last but not least, the extras: Google Keep integrates with Voice Actions! 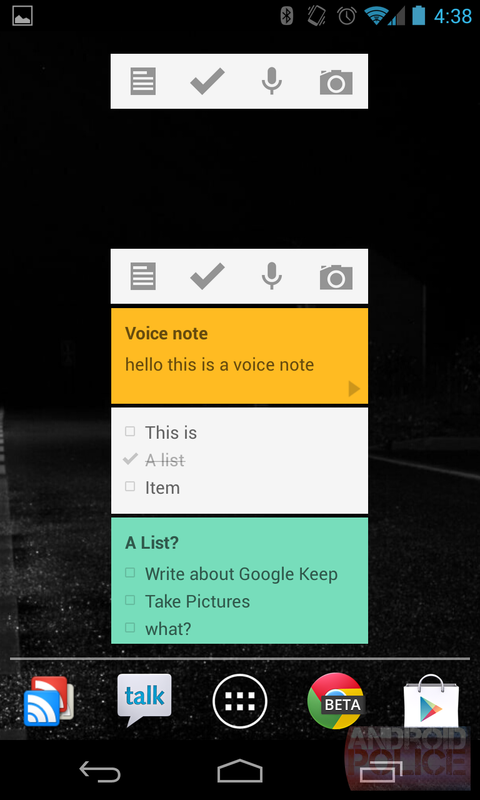 "Note to self" used to only send an email to yourself, but now you get the option to make a Google Keep voice note instead. 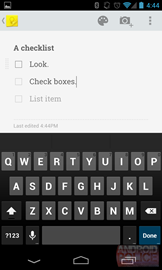 Keep comes packing a set of two widgets: a strip of 4 icons, or a resizable, scrolling note list - and yes, they'll work on your lock screen. 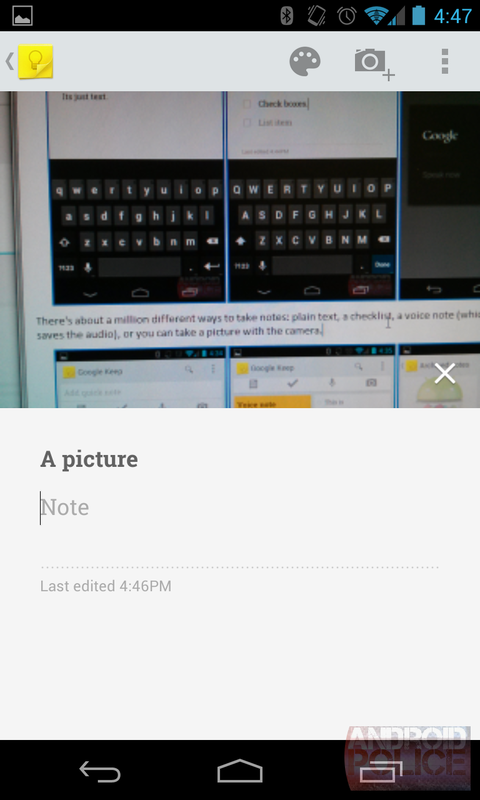 There's also a share handler, so you've got a handy way to move stuff from the gallery to a note app. 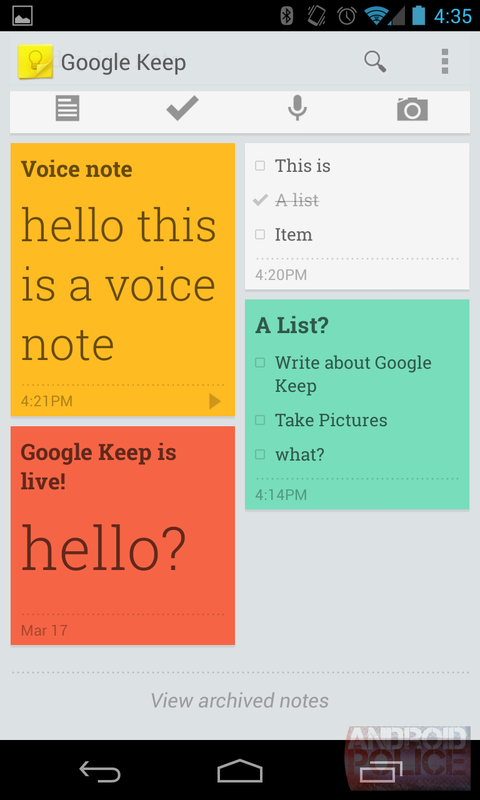 That's about it for the Google Keep Android app. 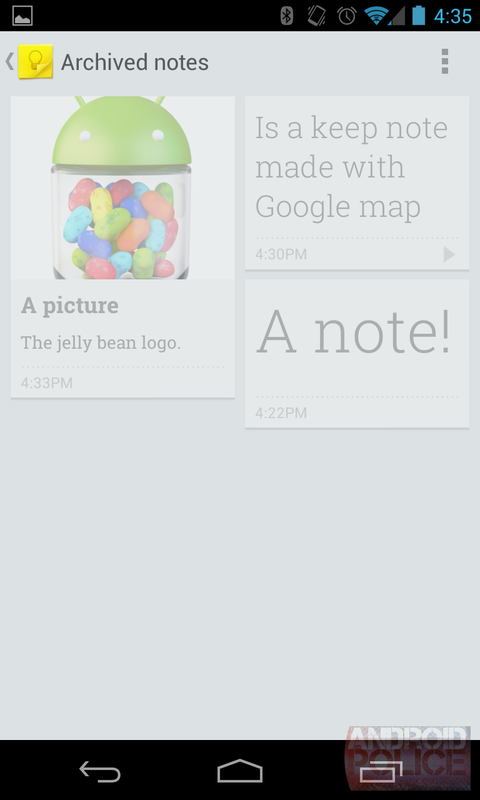 In closing I would like to say that this app is beautiful. 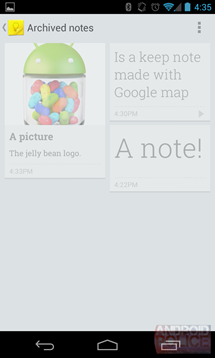 The white card interface is perfect for notes, and there are awesome little animations all over the place. It's like Google Now and notepad.exe had a beautiful baby. 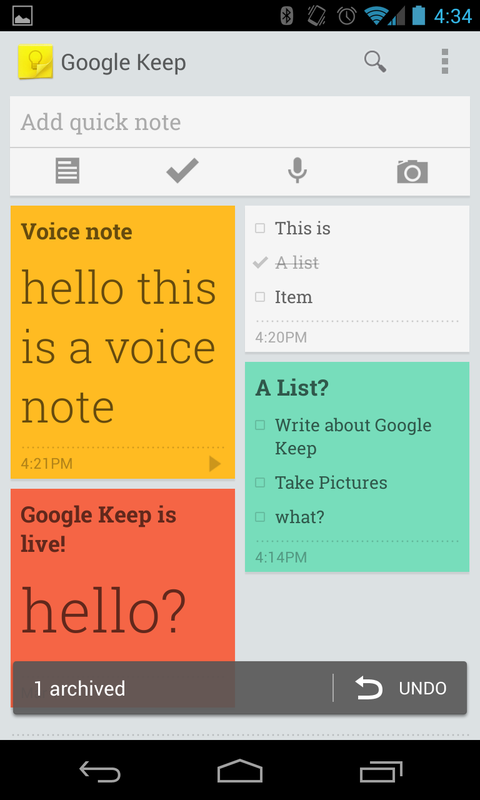 This is a million times better than a crappy yellow notepad app, isn't it? 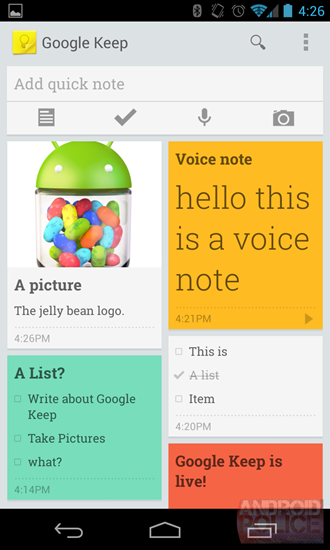 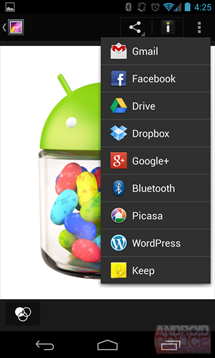 It's also great that, finally, Android has a native note app. 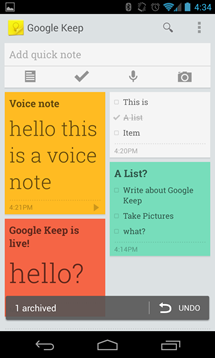 If we missed anything about Google Keep, let us know.